I was totally hooked by this book from the very first page and read it in less than 24 hours. Minette is overjoyed after suffering from the neighbours from hell when Cathy and her two children move in next door. Cathy seems very friendly and her two children – Davey and Lola are delightful. Davey has Muscular Dystrophy and is confined to a wheelchair and Cathy spends a lot of her time raising funds for charity. Minette is at home with Tilly her nine month old daughter and is starting to go a little crazy without adult company and conversation so she is probably more ready to be friendly with Cathy than perhaps she would have been normally and she is also just so glad not to have to creep around to avoid offending her previous neighbours. 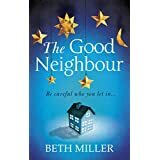 It is difficult to say much more about this book without giving away the plot but the reader will have no difficulty spotting there is something not quite right about Cathy, though Minette and other neighbours are less observant. Gradually the tension builds and details of Cathy’s past emerge, but not before Minette is embroiled in something that she wishes she had never got involved with in the first place. The chapters are told from the point of view of the different characters – Cathy, Minette and Davey and gradually the reader can piece everything together. I found I just had to keep reading to find out what happened in the end. It is a real roller coaster of a book with the tension building piece by piece. It will make you wonder about your own neighbours for a while – how well do you know them? Is what they tell you the truth? Should you trust them with as much information as you do? Highly recommended – especially for book-clubs as there are lots of potential discussion points. I received a free copy of this book from NetGalley for review. Oh this does sound very compelling… Will definitely watch out for it! It is very good – well I thought it was. It certainly kept me reading anyway. I hope you enjoy it too.